How many hours do you spend in the kitchen each day? If you’re like me, the answer is a lot! In many homes the kitchen is the hub, and everything from daily life to entertaining guests stems from this room. Did you know that a kitchen upgrade or remodel is one of the best places to put your home improvement dollars? Though there are plenty of men doing the cooking these days, women are usually the ones who fall in love with beautiful kitchens when searching for a new home. Since not everyone can afford to completely demo their kitchen and rebuild from scratch, here’s some ideas of how you can freshen up your kitchen for less! When making your choices, think about beauty AND function. Refresh the Cabinets ~ There are a few ways of doing this, and it all depends on what you’ve got to start with. If you have older cabinets with doors that aren’t very decorative, my favorite advice is to replace the doors and drawer fronts. This is easily done, and provides an instant upgrade. If you can’t match the existing finish on the cabinets (which is likely), then refinish or paint everything to match. Replace the hinges, door and drawer hardware, and you’re done! I recently finished a renovation on this kitchen, and we kept the existing cabinets in tact. They were very dated (as you can see from the before photo), but in great shape, so repainting them and adding some new hardware gave them a fresh and updated look! We also added a raised bar, to maximize functionality. 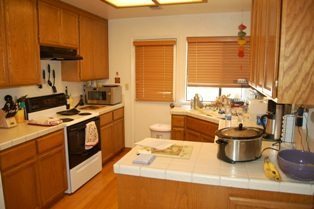 It cost $3,300 to have the cabinets professionally prepped and painted, and I estimate new cabinets would have been $18,000 and up. What a savings! Replace the Countertops ~ No surprise here! Though granite has been the desired surface for many years, there’s a myriad of choices for countertops, and it’s an instant upgrade to your kitchen. And, don’t stop there! While you’re at it, replace the sink too. Most kitchen sinks are under-mount (meaning the edge of the sink is underneath the countertop), so now is the time to put in a fresh one. Upgrade the Appliances ~ We don’t change our appliances like we change cell phones, but if you have appliances that are 20 years old, the money to replace them are dollars well spent, not to mention the new pleasure you’ll find in cooking! Gas cook tops and ranges are usually preferred over electric by avid cooks, and stainless steel has been the favorite finish for several years running. I love it because the color goes with everything, and find that it works well with any design style as well. 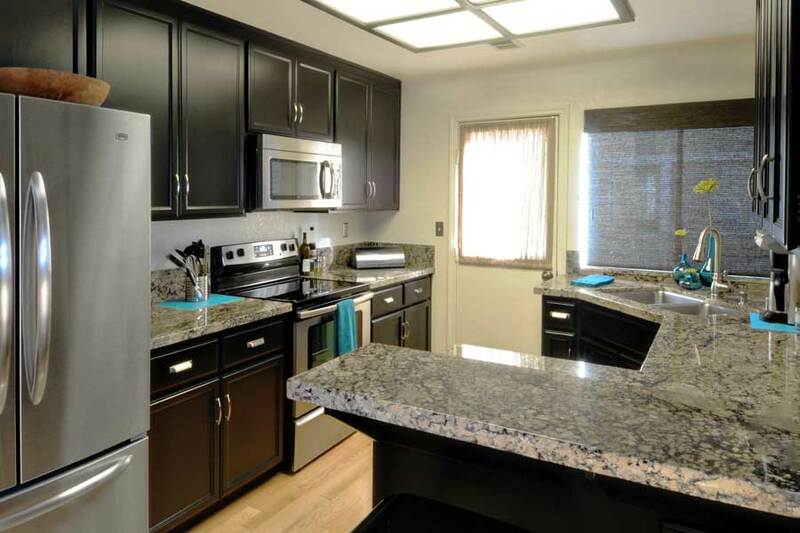 Look at what a beautiful difference it made in this kitchen! The impact of other upgrades would have been much less, had we kept the old appliances. Want to maximize YOUR kitchen for less? I’m just a phone call or email away! If I can give you assistance with your other design needs, please don’t hesitate to contact me. Many times a single consultation is all that’s needed to pull your project together!